I made my popovers in a muffin tin although you can purchase a special popover pan if you’re so inclined; I’m just a fan of using what I have in my own cupboards. If you do use a popover pan, this recipe should yield 6 popovers whereas if you use a muffin tin, you’ll end up with 8. High heat is important to the success of these popovers so when you’re ready to fill your pan, remove it from the oven quickly and make sure not to open and close the oven door while they’re baking. These are really best the day they’re made. Preferably warm. Preheat the oven to 450 F. Blend the eggs and milk together in a blender until combined. Add flour, melted butter, salt, cinnamon and vanilla until smooth and bubbly, about one minute. Let the batter rest for 30 minutes. While the batter is resting, it’s time to heat up the muffin pan. Pour 1/2 teaspoon of oil into each muffin cup, using only the outer 8 tins (leave the center ones empty — they won’t heat as evenly). Adjust oven rack to lowest position and make sure there’s not a rack directly above — remember your popovers are going to rise and you don’t want another oven rack to squish them. After the batter has rested 20 minutes, place pan in oven to heat the oil. You want the pan to have a good 10 minutes in the oven to heat. After batter has rested, remove pan from the oven and, working quickly, divide batter amongst the 8 muffin cups. Return to oven and bake for 20 minutes (don’t open the oven door). Then lower heat to 350 F and continue to bake until popovers are golden brown, about 15 minutes more. After removing from the oven, gently flip them out onto a wire rack. I used a butter knife here–sometimes they take a little shimmying. For the cinnamon sugar topping: mix the sugar and cinnamon in a small bowl. 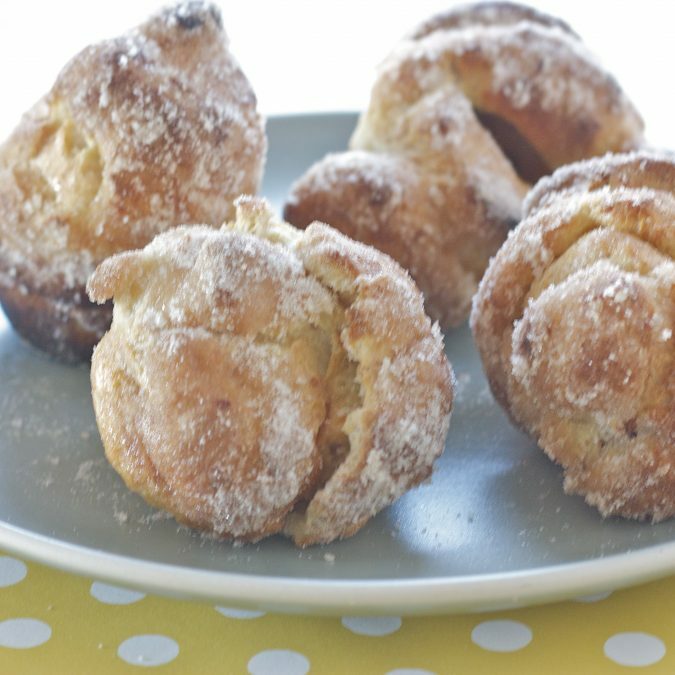 Thoroughly brush each popover all over with the 1/4 cup of melted butter, then dredge each puff generously in the sugar mixture. Enjoy warm.